How residential and commercial doors differ | Garaga Inc. When speaking about sectional garage doors for residential use, we picture doors with widths varying between 8 and 16 feet (2.4 and 4.9 m) and a height between 6 ½ and 8 feet (2.0 and 2.4 m). We also have a pretty good idea of how many times they’re used a day. When comparing those to commercial or industrial doors, it’s more than just the size that is different; it’s how they are used that really separates the two types of doors. For instance, a loading dock door, 8’ 6’’ by 8’ 6’’ (2.6 x 2.6 m) may open 50 times a day and be surrounded by heavy forklift traffic. As well, It goes without saying that it may be hit much more easily than a residential door of the same size. So let’s go over the major areas where commercial doors and residential doors differ. Whether or not residential garage doors are insulated, their thickness is most often between 1 3/8" and 2" (35 and 51 mm). Based on the level of insulation a homeowner is looking for, insulated garage doors use either polystyrene or polyurethane insulation. For commercial doors, their thicknesses range between 1 3/8" and 3" (35 and 76 mm), and most of them are insulated (polystyrene or polyurethane). As to what building owners are first and foremost looking for, “strength and energy efficiency” are most often mentioned. Additionally, polyurethane has the property of strongly adhering to the door walls, making sections stiffer and resistant to bending, opposed to a non-insulated door. As for door designs, clearly residential doors provide consumers with the most choices, both in wood and in metal. For commercials doors, door design isn’t as important, hence the number of designs is rather limited. Lastly, there are all-glass doors, with panoramic windows, such as those found at car dealerships, service stations and vehicle repair shops. This is where a greater difference is seen. The more a sectional door is used, the more the mechanism behind the door has to be powerful and efficient. Certainly, the size of the door affects this. A bigger and hence heavier door requires hardware to hold it that is stronger and more solid. One area where this is demonstrated is in the tracks. Residential doors use 2-inch (51-mm) hardware, meaning the tracks and the rollers that fit in them are this size. For commercial doors, either 2- or 3-inch (51- or 76 mm) hardware is used. As for the thickness of the steel used in the tracks, since residential doors are used less often, the metal is not as thick as that used for commercial doors. A difference is also apparent in the spring system (also known as counterbalance system). For this component, along with the size, hence weight difference, of a door, there is also the number of open and close cycles per day to consider. 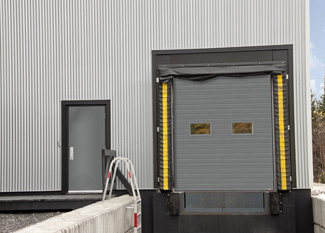 For instance, a loading dock door may be used between 25 and 50 times a day, justifying a heavier duty spring (25 to 100,000 cycles) than for a residential door (10,000 cycles) that may only be used twice a day. Another difference is found when we talk about the lift type of the door. The vast majority of residential doors use standard or low-headroom lift types. On the other hand, for commercial doors, depending on door height and the total clearance over the door, we find not only standard lift, but high lift and full vertical lift types. There are other components for commercial doors that are related to frequency of use, but very often this is based on the business avoiding both downtime from malfunctioning doors and expensive repairs from prematurely worn hardware parts. Another significant difference is based on the effectiveness of the frequent openings and closings of commercial doors. So while the size for residential openers is either ½ or ¾ HP, commercial openers vary between ½ and 1 HP. In addition, in North America, in terms of electrical power, commercial door openers are connected to 115, 220 or 575-volt systems while residential openers are exclusively powered by 115 volts. There are also several accessories that commercial garage doors may need, especially to ensure safe operation. 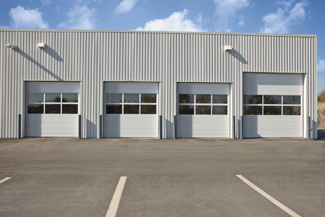 Are there other types of commercial or industrial doors? 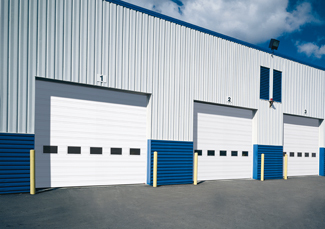 Although sectional doors account for more than 75% of the commercial and industrial garage door market, there are also rolling steel doors, that can be used as fire doors to separate two interior areas of a building, and high speed doors in PVC. Sectional doors are notably used for their thermal insulating properties. Certainly, when we require a high level of performance from a commercial door, this affects the initial cost of the door. 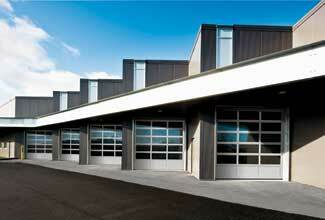 Commercial and industrial garage doors must be designed to stand the test of time. Their durability depends in large part on the quality of the hardware and other components, as well as the electric garage door opener and any of its accessories. The choice is then left to the building owner when the time comes to buy a door. Solid and sturdy components may have a higher initial cost, yet lower priced ones may require more maintenance and repairs over the lifetime of the door. Paying a little more to get reliable operation versus risking downtime due to an out of order door are the situations to evaluate.